Why would I choose a 400 year old opera for teenagers? I am just now catching up with the rest of my life enough to be able to reflect a bit on our spring opera at CAPA. 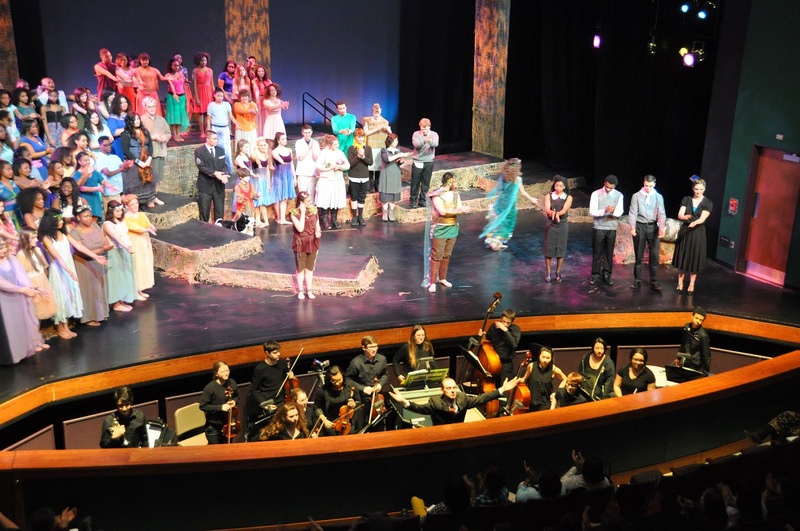 This year, we performed a very convincing and very successful "The Fairy Queen" by Henry Purcell. The piece was based on Shakespeare's A Mid-Summer Nights Dream (1592). Purcell performed his adaptation first in 1692! I have produced and conducted the Pittsburgh High School for the Creative and Performing Arts Opera Workshop for the past 15 years or so. Every year the discussion of repertoire comes up. Students ask for shows they know...everything from Aida to the Magic Flute, Phantom to Grease, Into the Woods and Carmen! It is such a crazy set of conversations. The students just would love some comfort... and comfort has very little to do with my vision for the course or for the act of performance at all. I am interested in the WORK and in GROWTH and their rich EXPERIENCE. I love the battle. Largely because we seem to win the battle every year. The teenagers come to the project thinking that the great experience is somehow wrapped up in the repertoire, like, the title of the opera will determine whether they will enjoy it or not. We learn anew every year that rep itself only accounts for maybe 10% of the experience, while the majority (90%+) of the true experience is based on the in-the-moment act of singing and acting and working in ensemble. We can experience this 90% in almost any show, and yet, if I were to program GREASE, we might run the risk of never realizing that the 90% was to be found in them, not attributed to the repertoire. Great performances only happen when the performers are able to give something of themselves to the performance. It has to be an act of sharing. If this is missed, there is nothing the repertoire can do to save it. I love the unknown (and sometimes distant) repertoire, because it provides a clear hurdle to jump over. In many of these cases, they won't like it until they learn to share. We all know we have won when the piece ceases to be distant and they take ownership of their own performance and then share that with the audience. THEN, after all of that, we can step back and think, what lessons do we learn when programming a 400 year old opera for teenagers? We are certainly teaching them about opera and musical drama and stagecraft and big singing. They sing un-miked with an orchestra and a conductor (me) in the pit. They have to deal with a real Staging Director (Bruce Hosteter), and a real Costumer (Lacey Barker), and props, and lighting (Chris Howard), and stage managers, etc. These are experiences that few teenagers ever get to be a part of. And after all of that the true lessons, the big lessons are just getting started. I love these lessons. This is why every high school in the country should be mounting large scale productions of any genre. 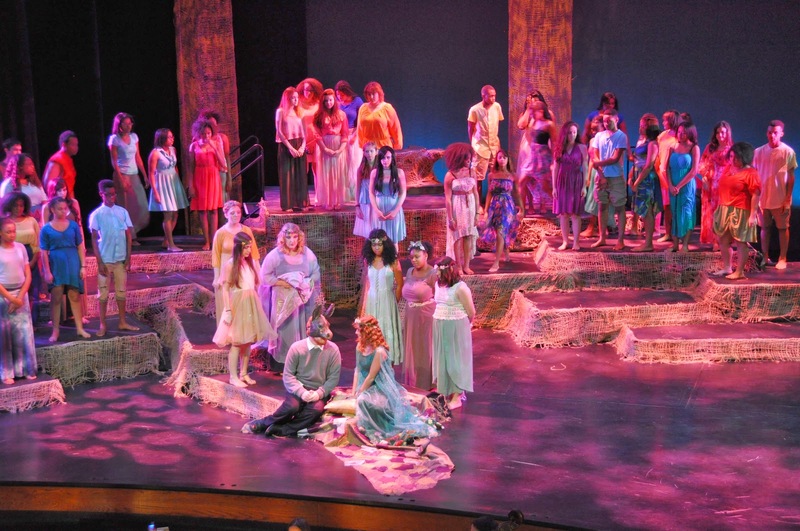 The Pittsburgh High School for the Creative and Performing Arts production of Henry Purcell's the Fairy Queen! A 400 year old opera + 80 teenage singers + 14 teenage instrumentalists + 3 dancers & 1 outstanding harpsichord player Alaine Fink! Special Thanks to the amazing (and most perfect for this collaboration) Director Bruce Hostetler and of course to all of the student performers. You never fail to teach me. I am so thankful for the opportunity to work with you. Click here for all the pictures! What is the difference between these 2.3 multitasking situations? I am conducting an opera. There is a 30 piece orchestra, all with different lines to play, different entrances, different cut-offs...there are 15 principal singers singing in solos and duets and trios and quartets, all with different lines to sing, different entrances, different cut-offs...there is a chorus of 60, with all of the distractions of being one of the crowd, who need to be kept in the ensemble with eye contact from the pit, and who all also have different lines to sing, different entrances, different cut-offs... I have, on many occasions, been able to not only keep the machine running, but prove that I can process multiple lines of attention, work many different variables at the same time, some choices about taking turns, some about shaping of time through tempo and rubato, some about prominence through volume, or staging, or eye contact, or articulation, and in other joint moments, bring the full production of nearly 100 players all together, all in the same groove, all in the same momentum, to one common goal, one common cadence. We ALL breathe together, beautiful and complete. I am at church. I am to help run the sound board this week. At the same time I am running the sound board, I am also to find 3 minutes in the service to just take a head count of how many people are in attendance today. Can I do it? NO! NEVER. I ALWAYS forget. I am at school. I am about to run a rehearsal with the 80 singers of my opera chorus. They are milling about finding music and their seats and finishing the conversations with their peers. Just as I am about to go to the podium, my peer teacher asks if I will please announce that there will be a bake sale today directly after my class and that everyone should go buy a cookie. I say OK. Do I do it? NO! NEVER. Not even once in 20 years of teaching. I ALWAYS forget. When out to eat with friends, I can't continue the conversation while trying to figure out the correct amount to tip the waiter. My wife believes that it is all about what you care about. If I just cared more, I would remember. I think the problem is I care too much, too much about the ONE task. I think it has to do with what is the ONE task. If the different parts come together to make a whole, I can multi-task. If the parts are separate, then there is not multi- just TASK+TASK. The key to the "ARTFUL" experience is figuring out how to bring the different variables together to make a completed whole. To recognize the counterpoint, the ensemble, the role of the different variables or players. To figure out the balance that creates momentum, momentum that allows us to reach the goal, with all variables having contributed. I have been looking for a PhD program that I can get excited about for a long time. After almost 10 years of searching and talking and meeting with many different schools and players, I think I have found a home in the Carnegie Mellon School of Design! I have been courting the School of Design for the last year with the hopes of convincing them that I might be a great candidate for their new PhD in [Interaction] Design. I am interested in applying ideals of live performance to the practice of design. In music circles we say that the performer is never called upon to be awkward; it is our job to demonstrate accuracy with ease. This ease in performance is an ideal that needs to be designed. We work with the elements such as tension and release, lightness and heaviness, inhibition and excitation, tempo and accent to create a conversation between the players. Obviously these elements are not reserved only for the musical arena. The stage musician builds the experience in the moment for his audience. The choreographer carefully builds the presentation so as to bring the audience into the dance. I am interested in harnessing this artful build up found in the fine arts to serve the broader daily, human experience. How can we inform or guide the average consumer toward richer, deeper, more organic interaction? Can we imagine a range of interaction where the goal is more natural, simple, meaningful, or truthful interplay? I am amazed and flattered, excited and terrified....they said yes. I start in the Fall.